I reckon there is at least one sour soup recipe in every S E Asia country. 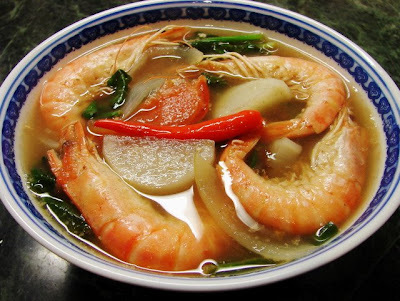 I had Chinese hot and sour soup and Thai Tom Yum numerous times, tried the Vietnamese Cahn Chua not too long ago and last weekend I had the Filipino version of Prawn Sinigang which was very refreshing and tasty, not as herbal and fragrant as Thai or Vietnamese but is a keeper will try again with other combination. 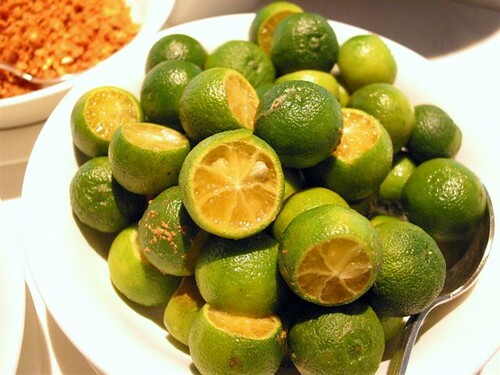 Sinigang is a common sour soup in Philippines and there are numerous recipes, the souring agent can be tamarind, guava, green sour mango, local small lime called calamansi (or limau kasturi in Malay) or a sour fruit called camias (or belimbing in Malay) , with lots of vegetables, meat or fish including using pork, ribs, chicken and any seafood. Heat the stock add mooli, onion and whole chilli, bring to a boil and simmer for about 15 minutes or till the mooli pieces are tender. Soak the wet tamarind with boiling water and loosen to extract the juice then sieve. Add tamarind juice to soup, simmer till boiling. 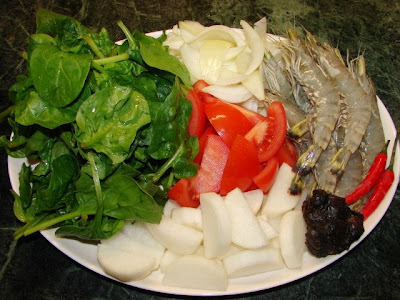 Add tomato, spinach or kangkong simmer for about 1 – 2 minutes, add prawns and boil till prawns turned pink. Season with enough fish sauce. Serve with rice or on its own. Best serve asap, if left overnight the green vegetable will turn brown. Sunflower your photo of the finishes soup looks so appetising. I can almost smell and taste it! Wonderful.